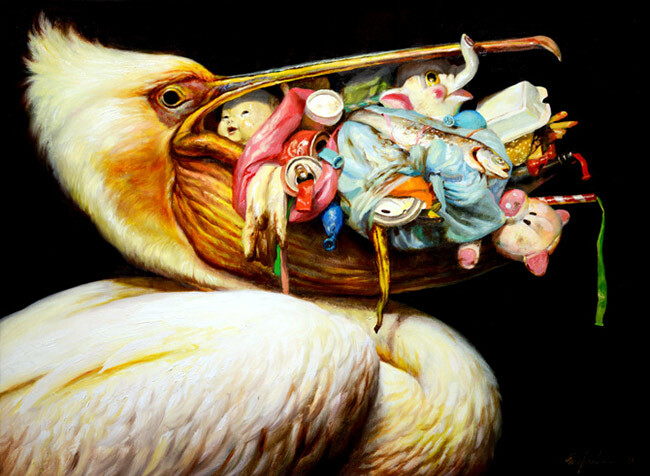 Through his paintings, Martin Wittfooth presents a world which is dystopian by its very definition. 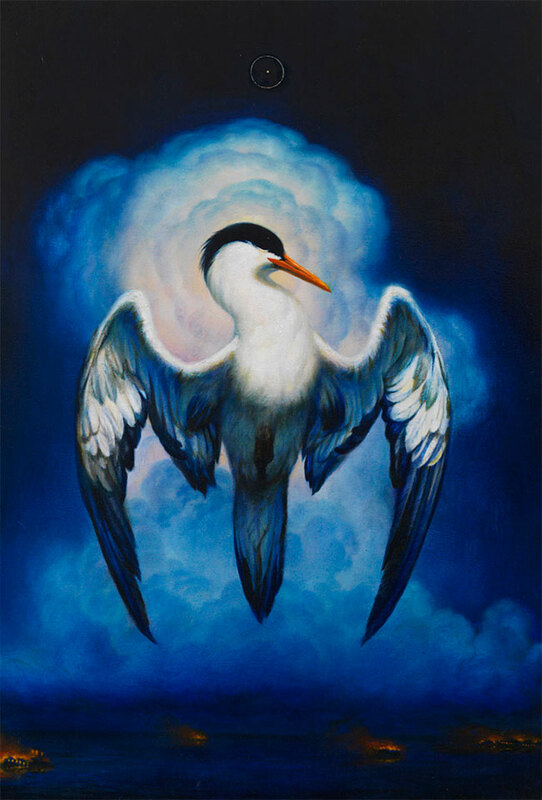 The Earth he depicts is void of human life, and filled with strong symbolic implications that the root cause is of our own making; pricipally our disconnection from, and disrespect for, the natural world. 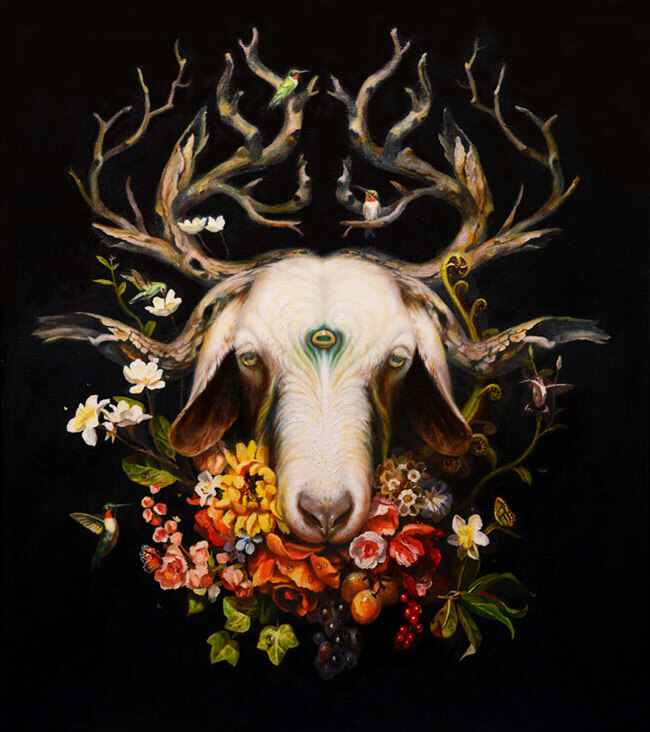 Not all of Wittfooth’s imagery is without hope however, and this is arguably true to the greatest extent of his most recent work, in which he explores the ancient art of shamanism and the current renaissance it is enjoying around the globe. 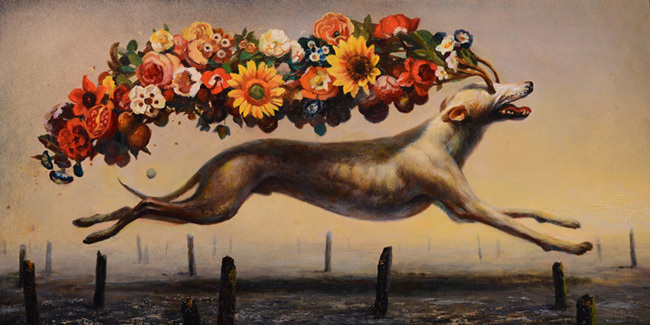 The optimism which emanates from these new works is a product of Wittfooth’s gradual uncovering of enlightening shamanic practices, which he has observed as holding the power to break us free from the status quo and the dark path it has lead us down. We are being asked to question the shortcomings of our present ideologies, be they economic, political or religious, and look inward, exploring our own consciousness, and through it build a stronger connection to the flow of nature. 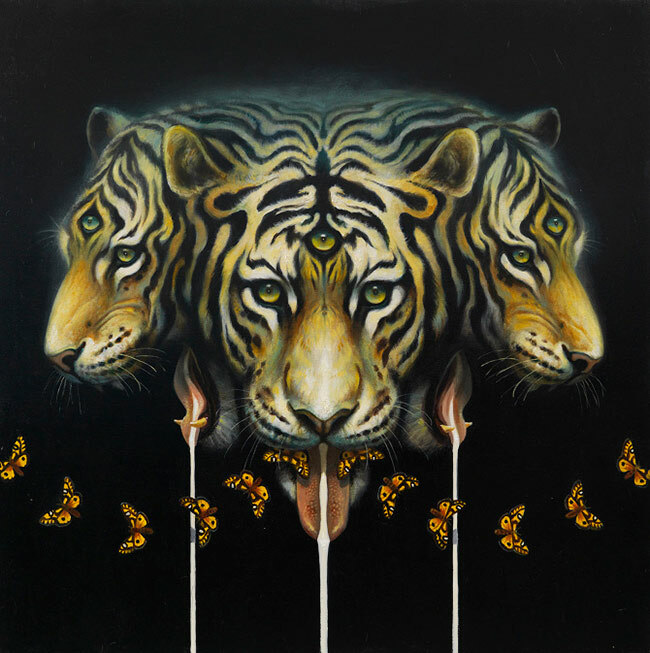 Martin Wittfooth was born in 1981 in Toronto, Canada. He spent his childhood in Finland, before moving back to Canada as a teenager. 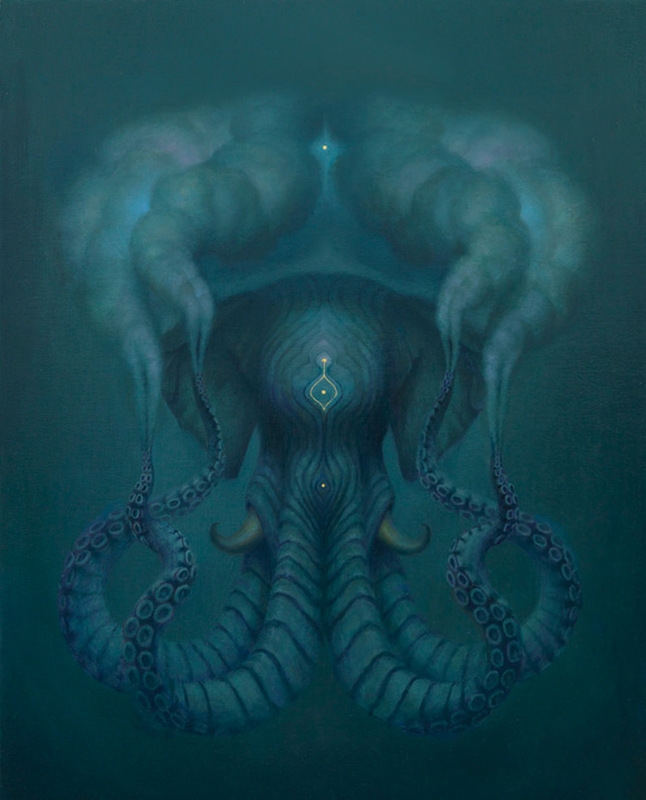 It was in Toronto that he earned his BAA in Illustration at Sheridan College in 2003. 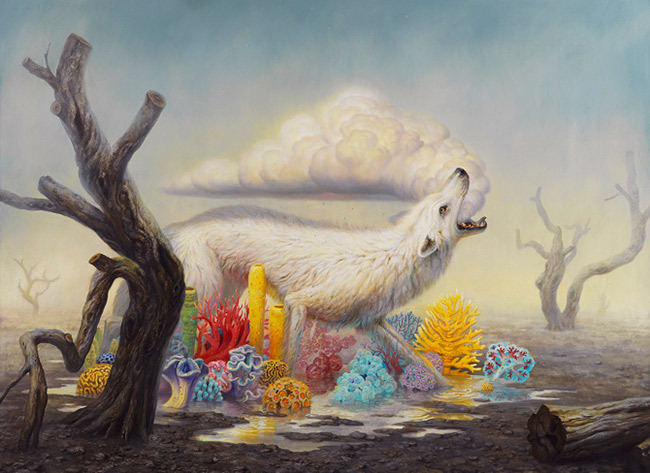 Wittfooth then moved to New York City where he received his MFA at the School of Visual Arts. 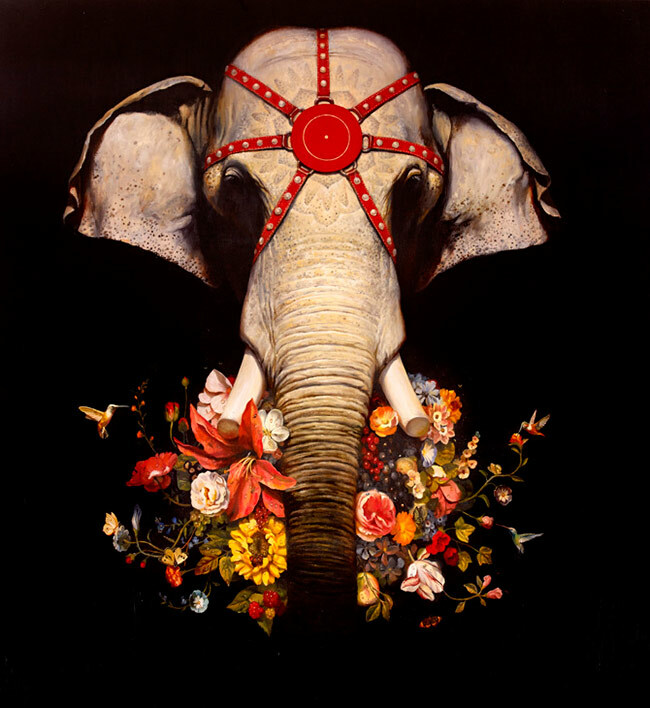 His artwork has been exhibited extensively in prestigious galleries and museums around the world. 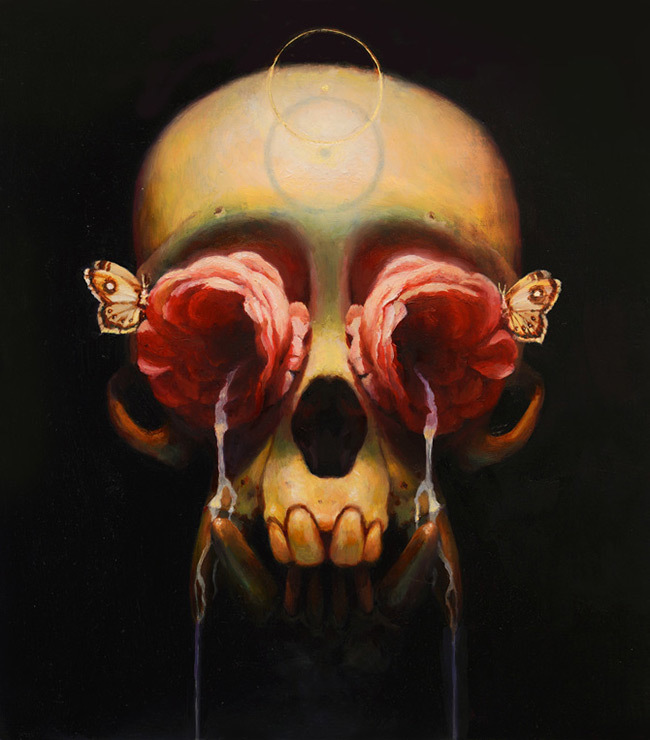 WOW x WOW is thrilled to be bringing you this exclusive interview with Martin, where we chat to him about ‘Offering’, his current solo show at Jonathan LeVine Gallery, and hear his thoughts about beauty in art, amongst other things. Read on! Hi Martin! First of all, thanks for agreeing to free up some of your valuable time in order to have this wee chat, we really appreciate it. 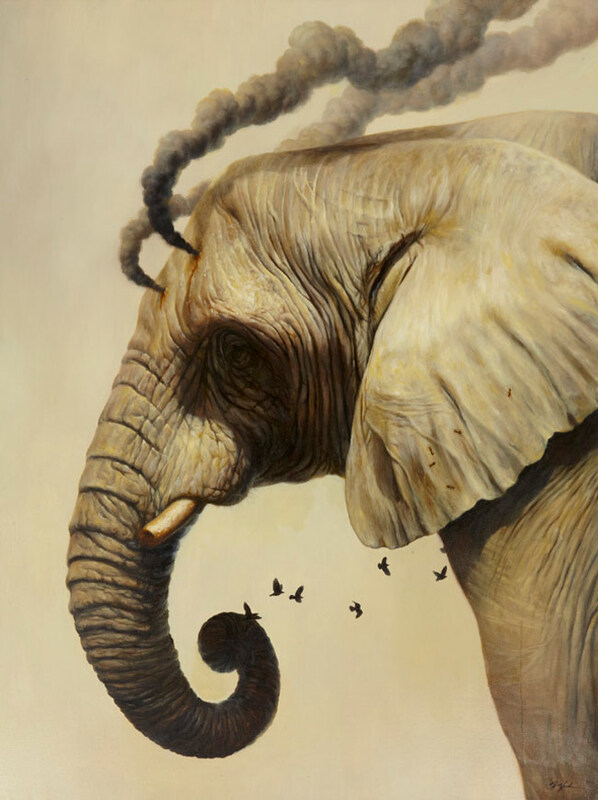 If you could please start us off by introducing yourself and talking about your background, touching on anything you feel has been relevant to shaping Martin Wittfooth the artist? I spent my childhood in Finland, and sometime in my early teens I moved to Toronto, Canada and then later, in my mid-twenties, to New York. I grew up looking at a lot of old European art, especially work by Northern European painters, like Arnold Böcklin and Akseli Gallen-Kallela (a Finnish painter), Anders Zorn (a Swedish painter), and Jon Bauer (a Swedish illustrator). I think being drawn to that work early on had a great influence on my tastes with regards to the kind of imagery I respond to, and consequently the kind of imagery I am inspired to create. I did my undergrad in illustration, thinking that I’d want to do this professionally, and went through the same discipline for my masters, which I got at the School of Visual Arts in New York. Training as an illustrator got me thinking about visual storytelling, and to explore symbolism and allegorical narratives. I live near Woodstock in upstate New York. It’s a beautiful area in the Catskill Mountains, with plenty of incredible nature to explore in any direction. I bought my property up here a couple of years ago and have been doing a lot of work on it since then: the land came with a large barn and a house, but both needed to be gutted and re-envisioned and converted to what I wanted, and I’ve been on that journey since I got the keys to the place. So far so good, too, I love this project and it’s been very fruitful. The one downside, but one that can be remedied with a bit of patience, is that while splitting my time between this property and my studio in Brooklyn I haven’t spent a whole lot of time connecting with the local art scene or other artists up here. I know that they’re around and I’ve had a few chats with a handful of them, but I have yet to venture out and connect on a deeper level with the community up here. I’m pretty partial to my solitude up here too, and work best with less distractions, so I’m taking it all in pretty slowly on purpose. 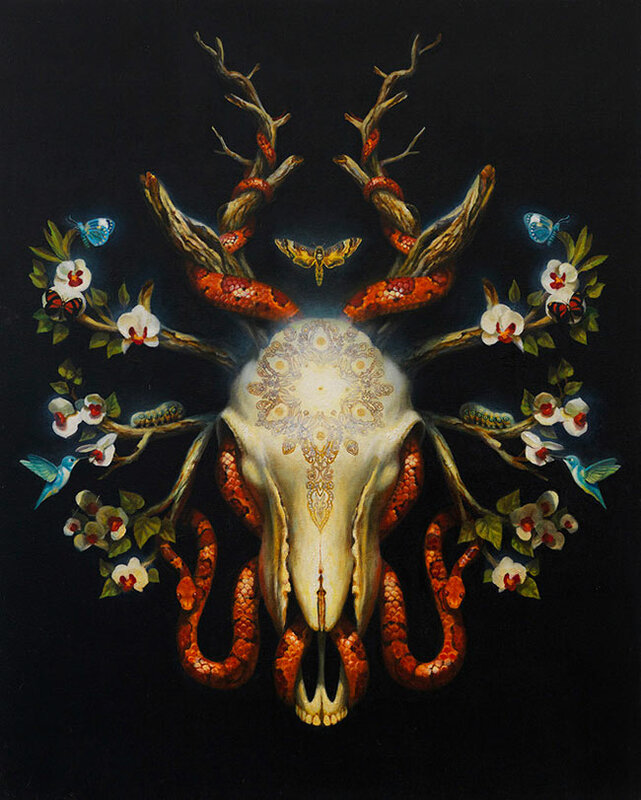 Your most recent solo exhibition, entitled ‘Offering’, is currently still on display at Jonathan Levine Gallery. 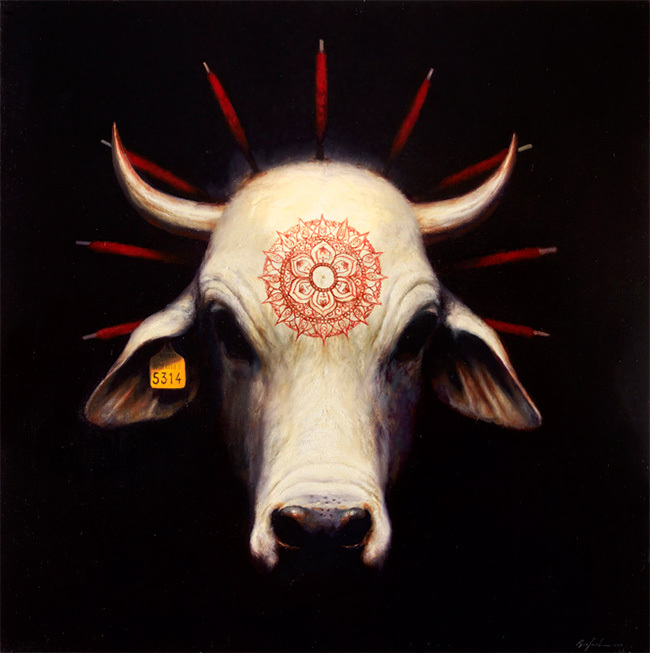 With this work you have stated that you are exploring the theme of shamanism and its current revitalization around the world. 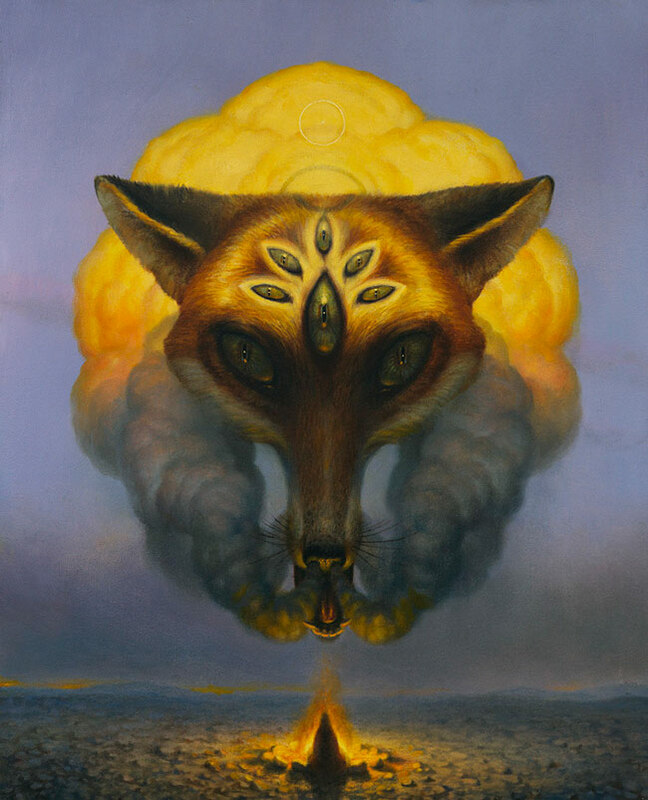 Can you give us some background on what it was that initially inspired you to investigate the various facets of shamanistic practices and how you have gone about examining them within your painted world? I’ve had some deeply interesting and profound experiences working with certain psychedelics, and these experiences have led me on a long quest to learn about the substances themselves, other peoples’ encounters with them, the history of their use, and their modern-day implications on the expansion of consciousness. Largely put into motion by the internet and the democratic distribution of knowledge and communication pathways, it appears that there is a kind of psychedelic renaissance underway. These substances did of course infiltrate and reshape culture in a major way in the sixties, but quickly got stigmatized due to very few people really knowing what they were dealing with, and much of this was met with fear by the media, politicians, lawmakers, and consequently by much of society as a whole, and was buried for a few decades. Recently though the veil has started to lift again, and therapists, researchers, and other curious explorers have once again taken a closer look at these substances, and some incredibly interesting results are being gathered and published based on research in their ability to help heal people of a wide variety of mental and emotional neuroses. It seems like more and more people are finding their way to these experiences, and in the majority of cases they are helping to give people a fresh perspective, new insights, a greater sense of connection, a loosening of the anchors that tie us to the material, ego-driven minutiae. While your work is based on your experiences of, and thoughts on, contemporary culture and the direction humanity is heading in, you don’t appear to date stamp your work with many intentional signifiers of our era. Is maintaining a timeless quality in your work something that you hold dear? I like to keep the cultural references I make in my work somewhat ambiguous. It’s just an intuition that I have, based to a degree on the notion that my work is often trying to point at: that nature and the human condition in relation to it is cyclical and self-repeating, variations on the same themes through time. I’m not as interested in speaking about events or topics specific to our era as exploring ideas of how our past, present and future flow together. What do you feel is the most vital factor for an artist to be open to, with regards to the evolution of their practice? Having been a professional artist for over a decade now, in what ways have you seen your own work evolve during this time? I feel that the most important quality I want to retain throughout my career is that of exploring, and a willingness to keep learning. I don’t think there’s an end goal to this pursuit – I hope that the day doesn’t ever arrive on which I declare that I’ve “figured it out”, but instead I hope to constantly find new directions to take my work into. Over the course of my time painting, I’ve discovered a whole lot about a bunch of elements that go into image-making. The medium, techniques you can try with it, new compositions, themes, and so on: every exploration opens up new insights – every new insight warrants further exploration. And so it goes. You clearly have a strong relationship with art history. Do you feel that it is important for artists to have a good understanding of what has gone before them? Can you talk about some of the artists from the past who have inspired you and why? What are your opinions about beauty in reference to man made artefacts? Is beauty something that you search for in art and is it something you consider when producing your own work? Yes, I think that beauty is something I definitely look for in the work that I admire, and look to infuse into the work that I create. Though I also realize that one’s own notions of beauty are highly subjective. 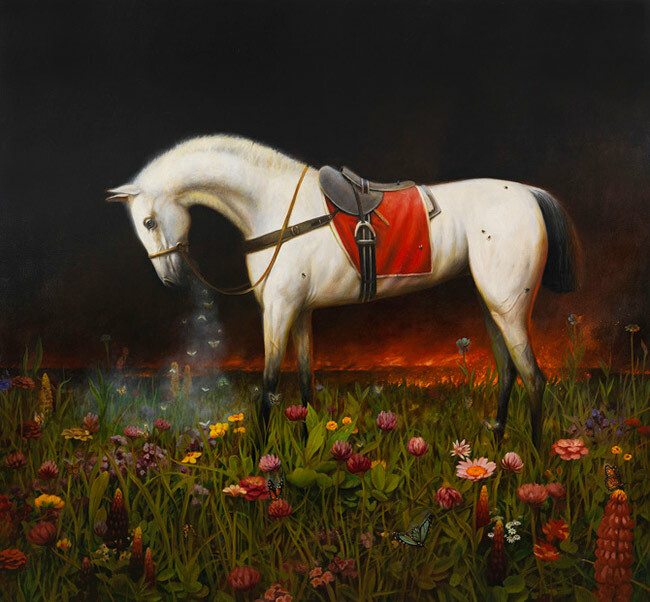 To me the most beautiful artwork embraces both light and dark – there’s often a kind of tension, a pull in different directions in the artwork that I’m most drawn to. What do you regard as the greatest motivation for you to get up every day and create? I think that the greatest motivation for me to keep painting is the connections that the work is making with some people. One can never predict how one’s own work can in some way influence someone else’s: my own thoughts and consequently my own artwork are shaped to a great degree by my encounters with the creations of other people – whether in the form of paintings or books or podcasts or lectures or music, and so on. I think what motivates me a great deal is feeling that I can in my own way contribute into the collective dialogue and inspire someone in the process. 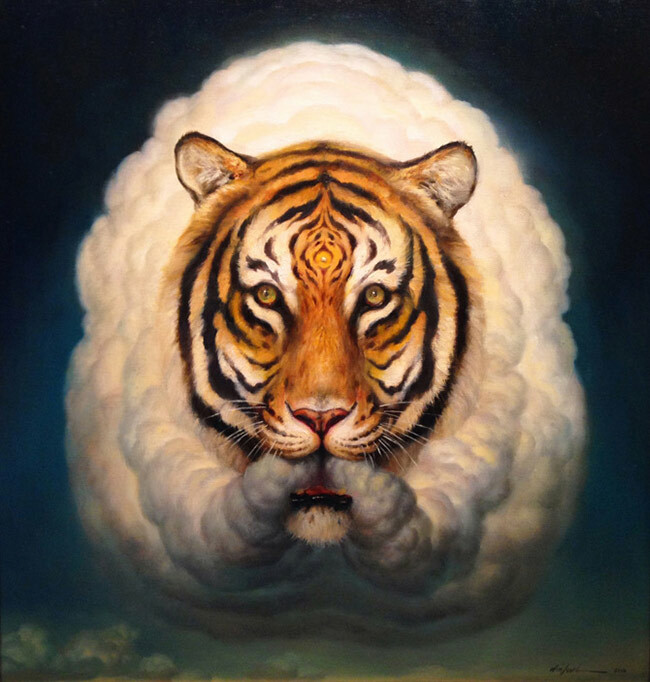 What’s next for Martin Wittfooth? I have a solo show at Corey Helford Gallery in Los Angeles in October 2016, and then my first museum solo exhibition at the Long Beach Museum of Art in the Fall of 2017. Mixed into all of that is the ongoing house re-building project I’ve taken on on my property, with the intention of eventually opening up a residency or artist workshop/lecture program up here.